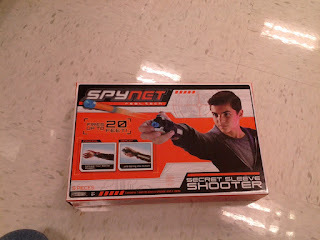 Buffdaddy Nerf: New Spynet Blaster Spotted! Before class, I stopped at Target to see what was in stock (Rough Cuts, Diatrons, etc. were all there). What I didn't expect to find was a new Spynet blaster, made by Jakks Pacific. Granted, to many of us 20ft. seems a pathetic range for a $15 blaster. 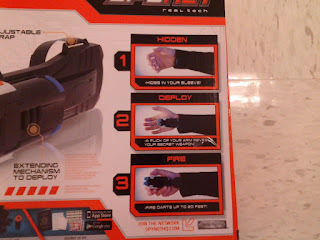 Keep in mind, though, the Nerf Wrist Blitzer was $9.99 when released in 1995, and if we take into account the Consumer Price Index as calculated by the US. Bureau of Labor Statistics...that's equivalent to about $15.05 in 2012 dollars. So for a new blaster from a smaller company, it's not unreasonable. I can't tell yet if you launch both darts at once, or if the dual button system really does allow individual firing. In any case, it appears to be a spring and base directly pushing the darts, based on both size and the fact that the darts are pictured with rubberized tails. However, the box is somewhat big for a wrist blaster, so we might yet be surprised. Don't keep your hopes up, though. 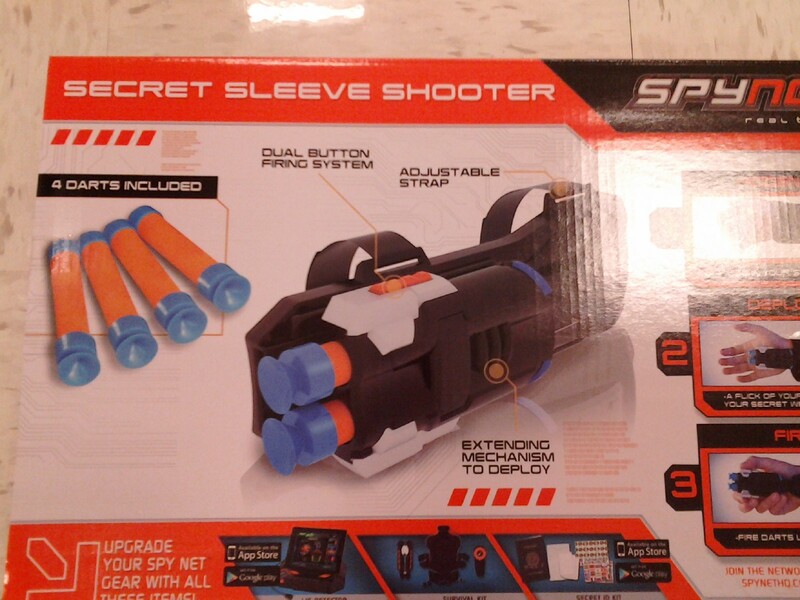 Their last "Secret Shooter" had the direct-pushing mechanism, so I'd expect that trend to continue. Even with a mechanism you can't really mod, I'd still buy one for kicks. I can see this being very effective as a last resort blaster, or in any game requiring stealth. It would make Assassins a lot more interesting, and would make for a nice emergency blaster for HvZ (you're not toting around large, obvious blasters), if you need to just run between classes with minimal confrontation. Would you be willing to buy one of these and ship it to me in California? These are actually available in California; I know a few people that have found them already. Yeah, these aren't going to be widely used, but they have a niche, for sure. I might end up buying one anyway, once HvZ stars up again. I just thought it would be fun to shoot my wife and kids with lol, do you think Fort Wayne would have them? I would like to know before I drive there and drop an extra $10 in gas for the trip. I really can't say; I've only seen them at half the Targets I've driven past in central Ohio. Seems more like something you'd take a peek for while going to grab something else.